State technology departments can expect a lot of leadership turnover in 2018, and those changes will only complicate efforts to keep pace with an accelerating technology market while managing limited budgets, the leader of the National Association of State Chief Information Officers said Thursday. Fifteen state technology chiefs left their positions in 2017, and while the high level of turnover in a mostly non-election year was surprising, said NASCIO Executive Director Doug Robinson, 2018 is expected to be even more tumultuous. With 36 governors up for reelection in 2018, 15 of whom will be term-limited, state technology offices across the country are expected to see a lot of change this year. The high level of turnover comes as government is exposed to some of the most influential technological changes in human history: autonomous vehicles, artificial intelligence, and the proliferation of both internet-connected devices and the bad actors who seek to exploit their weaknesses. In 2018, Robinson said, state government should expect to adopt these technologies — and contend with their associated challenges — without much in the way of additional funding. NASCIO reports that government budgets are expected to stay relatively “flat” in 2018, seeing just a 2.3 percent increase over the previous year. “‘Cautious’ is the word for the next couple of years,” Robinson said. As part of an annual forecast of what state and local government can expect in the coming year, Robinson co-presented a webinar alongside Alan Shark, CEO of the Public Technology Institute, who focused his half of the presentation on local government trends and challenges. A series of survey questions posed to the audience before the webinar revealed some of the most current, albeit unscientific, data available on the current trends in state government IT. While cybersecurity retained the No. 1 priority spot for state government leaders, digital government came in second, taking 26 percent of the votes from state IT respondents. And though cybersecurity is as important as ever to state government, NASCIO’s data shows that how technology offices are addressing security challenges is evolving. Rather than focusing purely on incident response, states are beginning to take a broader approach, looking to what Robinson calls “cyber disruption plans,” and more states are buying cybersecurity insurance. The survey also reinforced recent reported trends toward moving toward the cloud. When asked which business models will drive investments in the next five years, an off-premise, centralized (or enterprise) model dominated the results, gaining 55 percent of votes from state government respondents. NASCIO identifies cost effectiveness and flexibility as the top two issues driving IT outsourcing as CIOs become more like service brokers. “I think every state CIO aspires to have a modern IT organization and they believe they can achieve that better if they have the capability to source strategically and not have to be the purveyor of all the infrastructure and all the services,” Robinson said. Within the next two to three years, 47 percent in state government IT say they’re considering or have already planned moving to an off-premise mainframe as a service solution. Robinson said there’s a lot more maturity that needs to be realized within state government before everyone can make that move. Thirty-one percent outright said they aren’t planning such a move, while only 10 percent reported completing the migration. 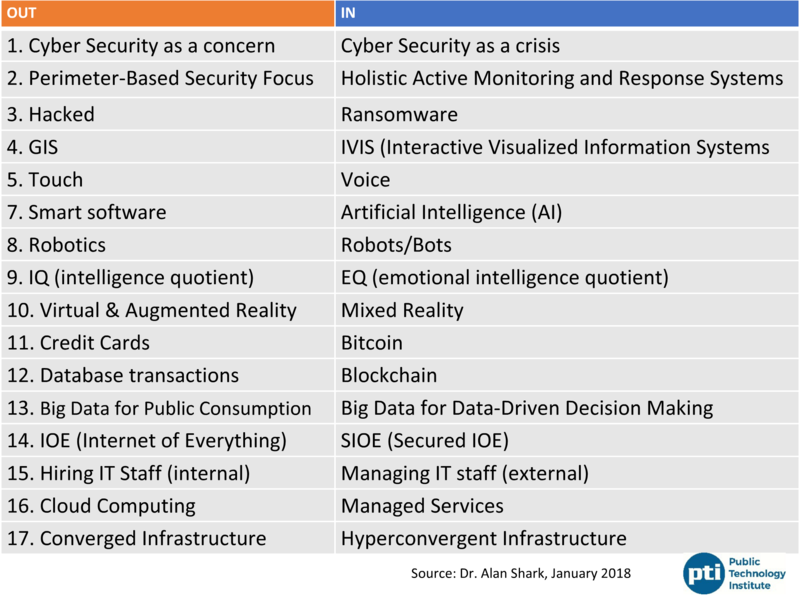 Shark presented a list of “ins and outs” for 2018, reflecting expected changes both in technologies and the terms used to describe them. Geographic information systems (GIS), robotics and converged infrastructure were in the “out” column, not because they’re going away, but because he said they’re evolving into new forms. GIS is being overshadowed by “interactive visualized information systems,” “robotics” is making way for robots and automated software (or “bots”), and converged infrastructure is being replaced by “hyperconvergent infrastructure,” data center technology that Shark said provides a smaller footprint that is easier to manage. Both Robinson and Shark said they were surprised at how fast new technologies like AI are emerging and being adopted and said 2018 will be a big year for creation of substantial government policy. “Topics like autonomous and highly connected vehicles and AI have gone from just early discussions into study panels and commissions and councils being established and some beta testing and proofs of concept going on,” Robinson said. “This is something that was not on our list and suddenly it has appeared big time and suddenly we have people with titles like ‘digital officer’ and programs totally devoted to this,” Shark said. “Those cities and communities that do not invest in the appropriate infrastructure will find a digital bypass sign outside of their neighborhoods,” Shark said.